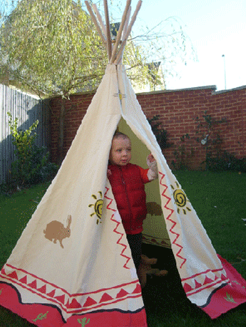 Tipis have always been very popular in our household. Our next door neighbours have one in the field next to our house and Tom has spent many a happy hour in it with Betty and Dolly during the summer months. During rather a desperate episode where we were housebound due to chicken pox, I tried to make the girls their own tipi, using bamboo and some sheets. It was utterly rubbish (I blame the broken wrist). So we were all absolutely thrilled to receive this wigwam from Playhouses.co.uk - it is the real deal with wooden poles and canvas material. It is sturdy, weather-proof, and pretty spacious inside. The kids love it, I love it, and even Tom, who is often pretty scathing about the kids' 'paraphernalia', loves it. Oh, but it must be such a nice decorative element to your interior. Ha ha, I'm sure its very cosy!